Well Resident Astronomer Peggy and I are offsite attending the Nightfall 2016 event in Borrego Springs. This is the second time we have been at this event sponsored by the Riverside Astronomical Society. Long time readers of this blog will remember about our November 8, 2015 post where this strange mysterious light bloomed up as all of us attendees were gathered in the outside amphitheater at that time. What is that mysterious glow? Check out the November 8 post for the details. 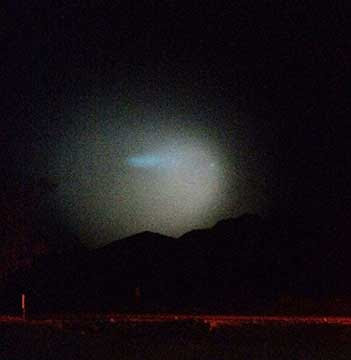 So, this time in Borrego springs, no mysterious light show, but wow, guess what we saw when we looked up in the sky this time? It wasn't just clouds you had to look out for. Check out the other large objects seen on the ground. They are all over the place. 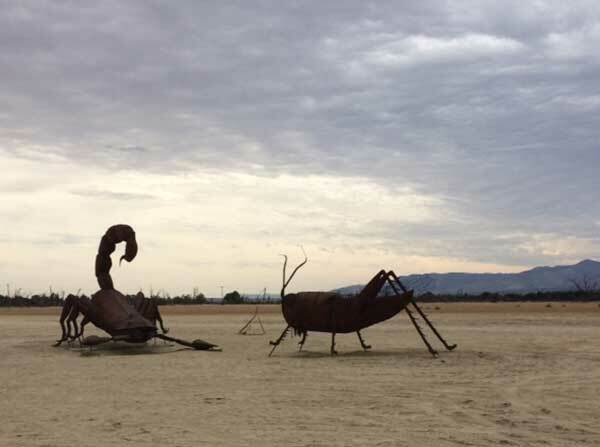 Thanks to sculptor, Ricardo Breceda, they are all over the place in Borrego Springs. Pretty neat. Anyway, we were able to keep out of harms way and made it back in time to attend one of the workshops. 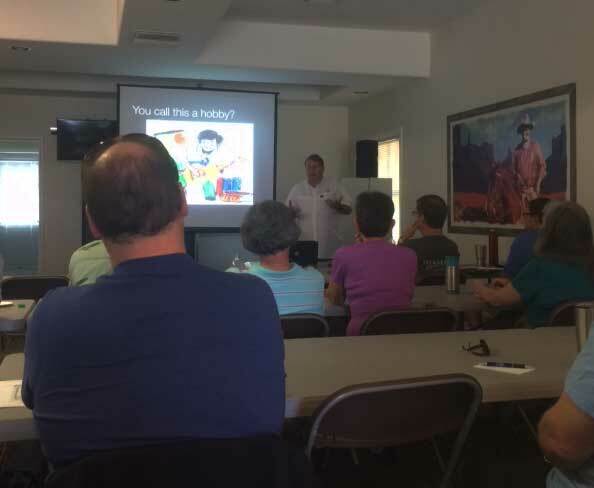 Now, I couldn't remember if I had already signed up for this workshop or not and so I contacted Alex McConahay, who couldn't find me on the signup site, so I had to signup just in time. Thanks for your help, Alex, and at the same time thanks to Mark Melnyk for organizing the whole Nightfall event. I attended the Richard Wright workshop on "Choosing and getting the most from your equipment and Astrophotography". He did a good job of covering the material and his experience as both a developer and user was quite extensive. He says if you aren't failing sometimes you aren't learning new stuff. Even though my interest in in doing more "sciencey" type work, the skills and capabilities needed for that and astrophotography are mostly the same and I do keep getting lessons through failure. 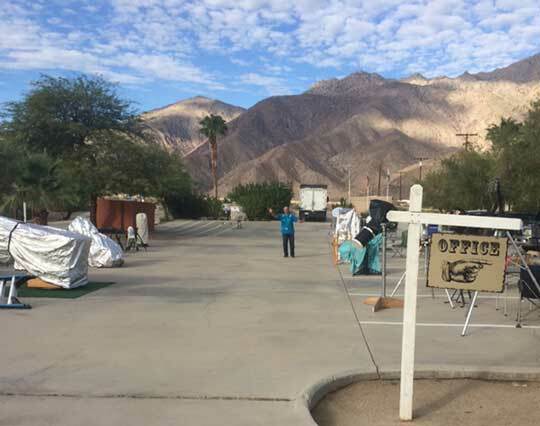 So, setting up your scope at Nightfall, located at the Palm Canyon Resort in Borrego Springs, is quite easy. 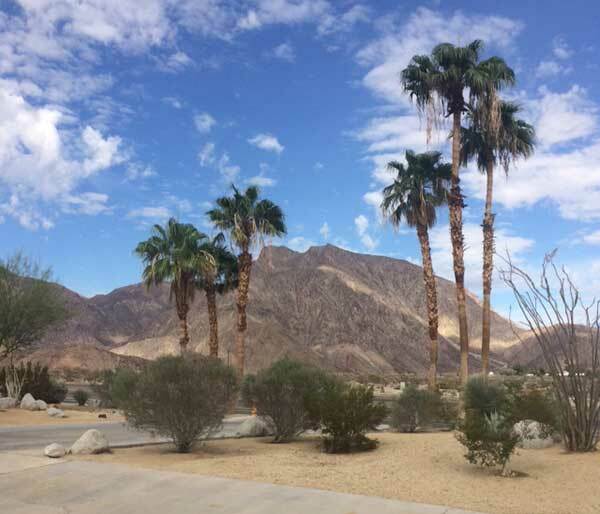 All you have to do is walk a short distance from your hotel room or RV space and claim your spot. Check out Brought his big Celestron, David, who is picking his spot early on. We bumped into several other folks from OCA, including David and Friend, Jerry, and Hikers and Astronomers, Jonathan and wife, who had some great accessories that I might have to get. First, he had a filter slide assembly that you could just move and select different filters just by sliding them in and out of the eyepiece. It was neat to see the difference. Now, I don't use an eyepiece that much anymore, but I sure liked the filter slide. I guess Mike at OC Telescope, or folks at OPT will be glad to assist me in purchasing something like that. We also bumped into other folks from Las Vegas, Palomar area, San Clemente, who enjoyed the dark skies. I also saw OCA Dr. Doug Milar, aka Dr. Zarkoff, in the distance but didn't get a chance to say hello. Resident Astronomer Peggy brought her binoculars and zero gravity recliner and I just brought my little Ioptron mount and the 150-600mm telephoto lens and DSLR. I like this combination because I can carry everything out and set up relatively quickly, which is especially useful for just making a quick exposure for AAVSO variable star studies or eclipsing binary studies. My main objective for dark sky viewing was to see if I could finally just get a few pixels from Pluto. I know its not a planet, but I want its pixels just the same and my plan was to take a long exposure to make up for small aperture. But it all depends on getting good pointing accuracy and good tracking accuracy. To verify, the alignment was correct, I slewed to various objects and if the object showed up in the camera Liveview, I knew it was pointing correctly. Check out the view of Orion Nebula taken with 500mm telephoto setting and 45 second exposure. There was some star trails in that image, but I went ahead and slewed the mount to Pluto. Now, the mount didn't have Pluto in its database, after all its not a planet anymore, thank you Mike Brown , so I had to look up Pluto's RA and Dec and enter that for the slew command. But, how to tell if Pluto is actually there or not. I can't see it in the image because Pluto is too dim and I can't recognize any stars that identify the location where the camera is pointing. I did know, from pointing to objects that I could recognize, that the mount aimed pretty closely to the target, within say a half dozen arc minutes, but that was not enough for me to identify a very dim object. So, I had to wait until the morning to use some analysis tools to find out where the camera was pointing. It was at this time, that the severe amount of star trails became apparent. Now the field of view of the camera frame is 1.47 x 2.2 degrees and the difference between the frame center and the location of Pluto is off by about 5-6 arc minutes, so if Pluto is visible, it will be in the camera frame. This verification is independent of mount setup and depends only on the position of stars in published star catalogs. But is Pluto actually visible in this image. Check out the 4 minute exposure below. Well, first of all, my tracking is quite off because all the star trails show the alignment is not very good. The star trails mean that the expected benefits of the long exposure are lost because the pixels from dim objects, and the bright stars too, are spread over many pixels rather than being summed up in one set of fixed pixels. 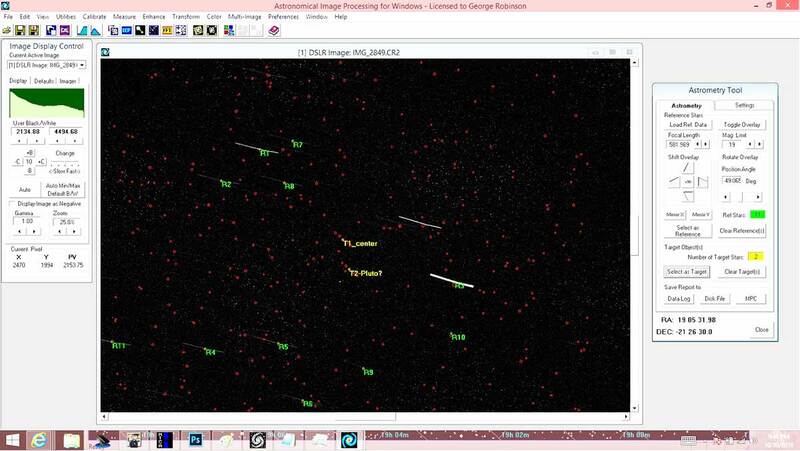 The analysis shown below uses AIP4WIN software to match the camera image with actual RA and Dec positions. 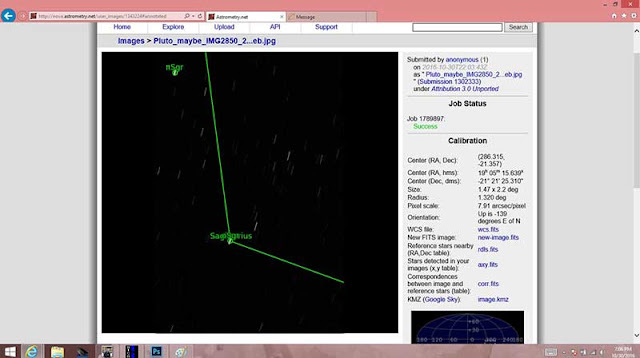 But, because of the star trails, it is not clear how to select the location of the reference stars. I just picked the center of the star trails and used that as reference stars. The predicted location of Pluto is the center of the four red circles arranged in a line. No dim object is seen there. If Pluto were actually visible it would have be streaked out too, just like the stars, but it is not visible. Seeing Pluto at magnitude 14 is not easy and with a small lens that I am using, long exposures with good tracking are going to be required, if it is going to be visible at all. Darn, that is just bad luck. I don't know why I sometimes get good alignment and sometimes not. I'll have to practice more on alignment and use the 3-star alignment process, like I know I should, but sometimes give in and try to get by with the easy way. AIP4WIN also has a distance tool that allows measurements between objects in the image. I used that tool and found the length of the star trail, for the brightest star in the image, is 340 pixels or equivalently 8.65 arc minutes. This means that if the incoming image had an object of size just 1 pixel, then the amount of light falling on that pixel for the entire 4 minute exposure, would be just 240/340 = 0.67 seconds. So the tracking error turns the 4 minute exposure into only 0.67 seconds on the pixel where the object would have been located without tracking error. That is a big problem and one of my next learning tasks is to get better alignment and see if it is my method or if it is my mount that is causing the problem. Its usually me that is the source of error. 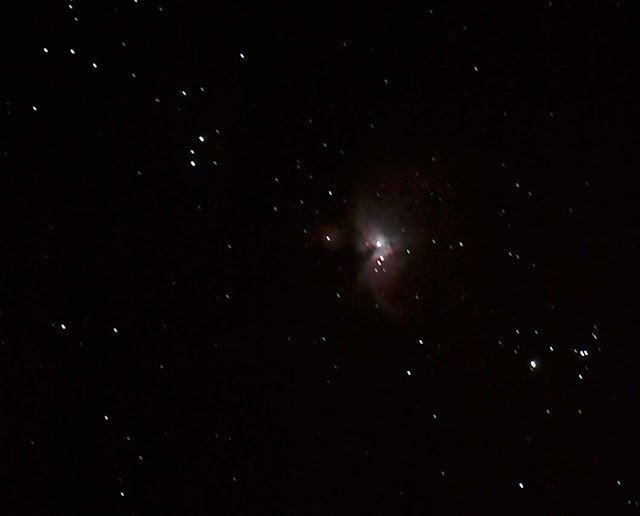 That is what it is like in the life of an amateur astronomer trying to learn the tricks of the trade and the skill and capabilities necessary to collect good images or good data. So, while I continue to learn, getting a little consolation with my martini doesn't seem so bad. 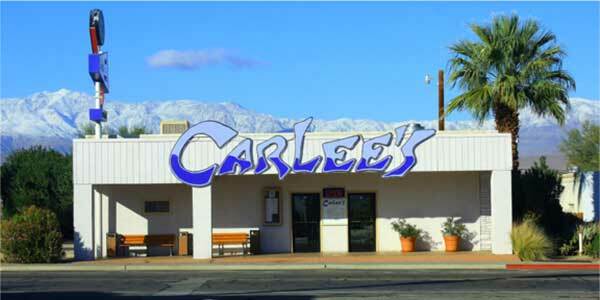 Carlee's is always our go to place in Borrego Springs for good lunch/dinner and martinis. But all in all we had a great time at Nightfall and we always place it on our calendar. One of the events, I always enjoy is Dennis Mammana's "Nightfall Skytour", which is fun, but this year the clouds just did not stay away and it was hard to point to some constellation and star, only to have it disappear behind the clouds a few seconds later. But one thing Dennis said that always impresses me is how photons from some distant galaxy have travelled for millions of years and how just a few of those photons end their long journey in our eyeballs and are absorbed and identified. P.S. We will be offsite again for Cities of Antiquity Mediterranean cruise(Athens, Rome, Jerusalem, and a few island stops) the next couple of weeks and are not taking any astronomical equipment other than our own eyeballs, so we may not post until our return.